Use a wooden spoon to stir together gelatin and warm water in a large bowl. Add corn syrup and flour, then mix. Add half of the birdseed and stir until all of the seed surface is coated with the gelatin mixture. Add the rest of the birdseed and stir to coat. Add dried fruit (if desired) and stir. Spray cookie cutters and/or mini Bundt pans with cooking spray. 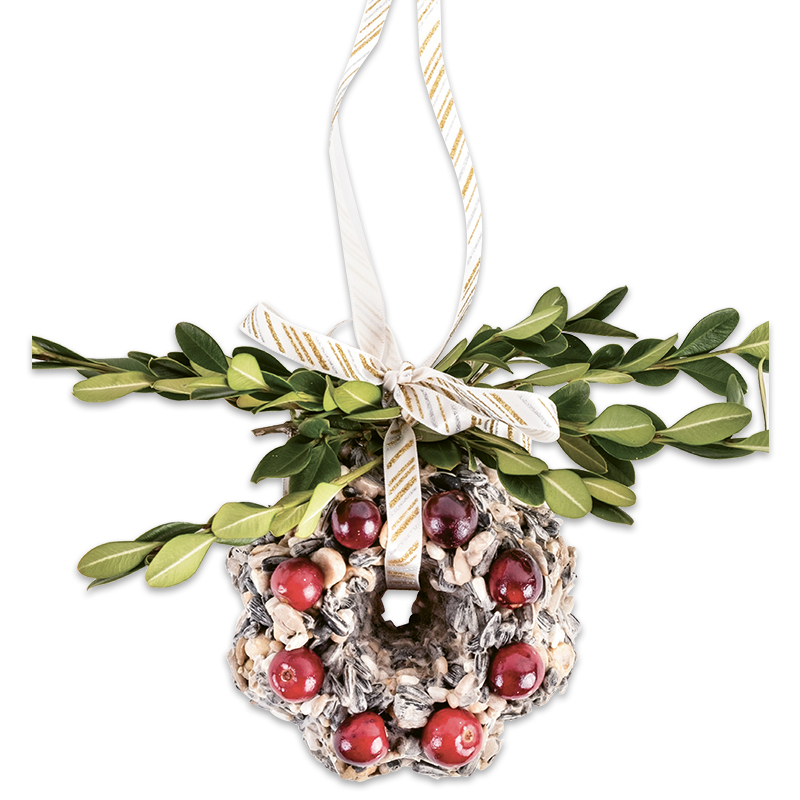 Feed the flock in jolly style with easy birdseed ornaments trimmed with fresh cranberries, sprigs of greenery, and any other wildlife-friendly adornments you can dream up. If using a Bundt pan, place cranberries in the bottom of each mold. Spoon in seed mixture to fill the mold, firmly compressing it with the back of a spoon. If using cookie cutters, you’ll need to create a hole in the ornament to string ribbon through. To do so, hold a paper straw vertically where you want to make the hole, and fill the seed mixture in around it. Use a spoon to press the mixture down firmly. Let the ornaments set until firm, about eight hours. Remove from molds and let dry for 24 hours on cooling racks. Add ribbons for hanging the ornaments. Rain and hot sun will melt the gelatin, but don’t worry—the birds won’t let these treats last long.